The NASA that we’ve known for over 50 years has been a lie. My name is Richard C. Hoagland. As the brief authors’ biography page states, I was indeed a NASA consultant to the Goddard Spaceflight Center in the post-Apollo era, and Science Advisor to Walter Cronkite and CBS News, Special Events, advising CBS on the science of the NASA missions to the Moon and Mars, during the Apollo Program. I currently run an independent NASA watchdog and research group, the Enterprise Mission, attempting to figure out how much of what NASA has found in the solar system over the past 50 years has actually been silently filed out of sight as classified material, and therefore totally unknown to the American people. My friend and colleague Mike Bara and I are going to attempt the impossible in the next few hundred pages: we’re going to try to describe, and then carefully document, exactly what’s been going with NASA in terms of that classified data and information. It won’t be an easy task. The predisposition of most Americans - even after the Challenger and Columbia disasters and a host of other “missing” spacecraft - is to place NASA somewhere on par with Mother Teresa in terms of public confidence and credibility. This is, in major part, due to the average American’s (to say nothing of the media’s) inability to figure out a reason why NASA - ostensibly a purely scientific Agency - would actually lie. NASA is, after all, holding high the beacon of our last true heroes, the astronauts. I mean, what’s to hide regarding moon rocks, craters and space radiation? If we’re right, a lot. However, even a hint that NASA - or, more precisely, its leadership - has been carrying out any kind of hidden agenda for over 50 years is, at best, met with disbelief. The vast majority of NASA’s nearly 18,000 full-time employees are, in our analysis, innocent of the wrongdoing of the few that we are going to describe. 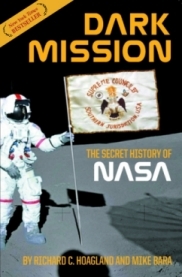 To even begin to understand the extraordinary case we are presenting in this book, to fully appreciate what NASA has been quite consciously, deliberately and methodically concealing from the American people and the world for all these years, you have to begin with NASA’s turbulent past - specifically an account of its origins in the increasingly dangerous geopolitical environment Americans were thrust into in the wake of World War II. The governmental institution known as NASA is a department of the Executive Branch, ultimately answerable solely to the President of the United States, an Agency created through the National Aeronautics and Space Act of 1958. But contrary to common public and media perception that NASA is an open, strictly civilian scientific institution, is the legal fact that the Space Agency was quietly founded as a direct adjunct to the Department of Defense, tasked with specifically assisting the national security of the United States in the midst of a deepening Cold War with its major geopolitical adversary, the Soviet Union. Clearly, from this and the other security provisions incorporated in the Act, what the Congress, the press and the American taxpayers get to see of NASA’s ultimate activities - including untouched images and data regarding what’s really on the Moon, on Mars or anywhere else across the solar system - is totally dependent on whether the President of the United States (and/or his legal surrogates in the Department of Defense and the “intelligence community”) has already secretly classified that data. This is directly contrary to everything we’ve been led to believe regarding NASA for over 50 years now. After NASA was formed, almost before the ink was dry on the Bill that brought it into being (which, among many other detailed objectives, called for “the establishment of long-range studies of the potential benefits to be gained from, the opportunities for and the problems involved in the use of aeronautical and space activities for peaceful and scientific purposes”), NASA commissioned a formal “futures study” into the projected effects on American society of its many planned activities (including covert ones). The results of this multi-disciplinary investigation were officially submitted to the administrator of NASA in late 1960, and after the Kennedy Administration was elected, to Congress in April 1961. This quietly inserted sub-section of Brookings is revealing on many levels, and it forms the documented basis of our case - that the NASA “you thought you knew” doesn’t actually exist, and that NASA has been deliberately concealing and classifying its most significant discoveries because of “national security” rationales. Brookings officially affirmed NASA’s expectations that the Agency would fly to nearby planets in the solar system, and would thus be physically capable, for the first time, of confronting “extraterrestrials” right in their backyard. Did any skeptics even know this official document existed, before we made it public in 1996?